"I love helping people," Sheri Knepel says. In fact, she has built her two careers upon that passion for caring: nursing and real estate. Inspired by a childhood experience helping a neighbor with a broken leg, the Wisconsin native earned her RN nursing degree in 1984 and excelled in a career that took her everywhere from California to Florida to the intensive care unit of the world-renowned Mayo Clinic. After settling in Oshkosh with her husband and their two children and honing her business skills serving as Director of Development for Valley Christian School, Sheri turned her focus to real estate. 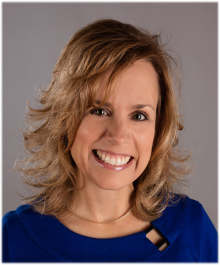 Combining her genuine care and commitment with her local knowledge and business savvy, Sheri quickly established herself among Winnebago County's most dedicated and successful real estate professionals. Since joining First Weber in 2008, she has earned awards every year for her outstanding sales and committed service to her clients. "I care about people succeeding," Sheri says. To assure her clients' success, she has continued to refine her own skills, earning the distinguished Senior Executive Associate designation (SEA), Accredited Buyer's Representative (ABR®), Certified Residential Specialist (CRS), and Graduate, REALTOR® Institute (GRI) certifications. Working with Sellers and Buyers throughout Winnebago County, Sheri has a special focus on waterfront property and a unique compassion for first-time Buyers. Treating each client as if they were her only client, Sheri is widely respected for her clear communication, her genuine concern, and her ability to deliver prompt, professional service and outstanding results with a minimum of fanfare. When she says, "Your home, your future...My Commitment!" Wisconsin Buyers and Sellers know that their best interests are in good hands with Sheri Knepel. First Weber Oshkosh's "Circle of Distinction"
First Weber Oshkosh's' "Circle of Excellence"
First Weber Oshkosh's "Circle of Excellence"
2013 Top Level Producer w/Over 70 properties SOLD! 2012 Top Level Producer w/67 Properties SOLD! First Weber Multi-Million Club and "President's Award of Honor"
First Weber Group Oshkosh "Circle of Honor"
First Weber Multi-Million Club and member of the 'Sterling Society"
First Weber Multi-Million Club and induction into the "Sterling Society"
Achieved Certified Residential Specialist (CRS) - the "master's degree of real estate". (Only 3% of REALTORS hold this designation due to its stringent education and experience requirements). Enough about me - time to hear your story and help you achieve your real estate goals!